Greenport and Whaling were one word in the 1800s. Vessels from all over the world sailed into our waters and looked for a safe harbor like Greenport to replenish their supplies and re-kindle their spirits for the next long voyage in search of the mighty gargantuans of the sea. In 1854 the Portuguese Whaler “Neva”, from Fayal in the Azores, docked in Greenport with a whaler on board named Manuel Claudio. For the next 16 years the “Neva” set sail from Greenport on even longer and more arduous journeys, sometimes sailing for “two years before the mast.” In 1870, Manuel garnered enough to set foot ashore, never to sail again, and open “Claudio’s Tavern” It has been in the family with a Claudio at the helm ever since. History surrounds you in this National Historic Registered Building, circa 1845. The magnificent Victorian bar was installed in 1886 by Manuel who salvaged it from an old hotel being torn down in New York’s Bowery in 1885. At the end of the bar is the beautiful mirrored hardwood saloon door which served as the summer entrance. During prohibition, Claudio’s, now under Frank Claudio, Manuel’s nephew from Portugal, became a fine French restaurant downstairs, while the upstairs became a lively place for imbibing in the illegal spirits that found their way by the boatload from the southern islands through Greenport on the way to the City. Behind the glass door at the left of the bar is a dumb waiter that let the folks downstairs join in the fun too, sipping on their “water” glasses. Throughout the east end of Long Island, bootlegging had become big business!! In the dark of the night, and preferably in the heaviest fog, they would race for port and often glide into the harbor and under Claudio’s, which then sat on stilts, off-load their goods through trap doors for the later trip west. One trap door still exists behind the bar – now used to handle utility services under the building. In the late twenties, Greenport became the mecca for our country’s sailing forays in defense of “The America’s Cup”, which was wrested from England in 1851 by the yacht “America”. Around the walls of Claudio’s hang photographs and artifacts from our cup defenders including the great “J” boat racing ships. Many were outfitted by S.T. Preston’s just across the street from Claudio’s. Over the front porch windows of Claudio’s you will find a piece of the main mast and the lower spreaders of the yacht “Enterprise”, Commodore Vanderbilt’s east-end crew who successfully defended the 1930 Cup Race. For fifty-plus years Bill Claudio Sr. carefully guided Claudio’s. 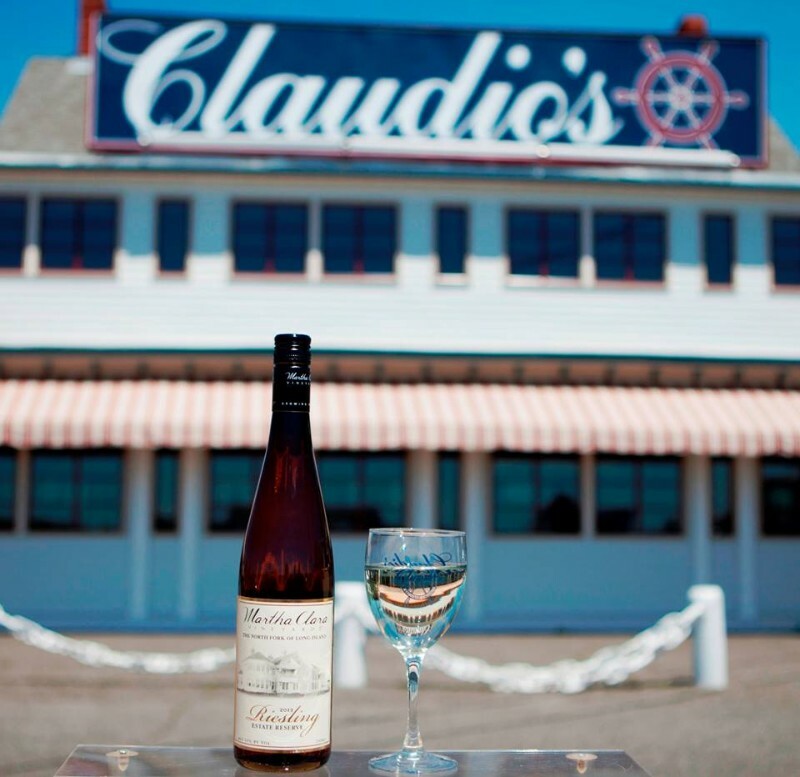 He did a wonderful job preserving Claudio’s as one of the most historic and well-known dining and boating sites on Long Island. In 1990, we, the fourth generation of Claudio’s, embarked on the continuing voyage. We are proud of our 142nd Anniversary in 2012 and recognition by the National Restaurant Association as the oldest, same family run restaurant in the United States.